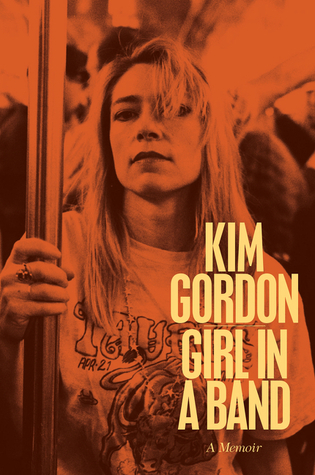 Girl in a Band By Kim Gordon. In Girl in a Band, Gordon writes about many things ranging from her band and its music to her marriage to her childhood. She writes about Sonic Youth which she formed in 1981 with guitarist Thurston Moore and guitarist Lee Renaldo and recalls seminal albums and videos and songs. She writes about her long-term relationship with husband Thurston Moore, the music business and feminism. She delves into growing up in California with her progressive parents, the difficult relationship with her older schizophrenic brother, becoming part of the New York art scene in the 80s and 90s and about being a mother. On one’s twenties, Gordon has opposing views. In one chapter she writes: “Questioning things fit in with “becoming” which in turn brought me closer to living in the present and farther away from the idea that you’re done, ready, formed, or cooked at some present age like your early twenties.” She says that she understands why Lena Dunham’s show Girls resonates with many. Then two chapters later she writes: “I find it strange when people don’t know what they want to do in life.” Really? That seems diametrically opposed to your earlier remark. I think that one’s twenties should be when one explores both professional and personal goals. Not everyone knows her career path at 21. After three decades together, Gordon discovered– in the usual predictable ways—texts and emails–that her partner Thurston Moore cheated on her with another woman. She felt naturally overwhelmed and deceived. She notes: “I wonder whether you can truly love, or be loved back by someone who hides who they are. It’s made me question my whole life and all my other relationships.” One can only imagination the devastation. So much time. So many years together and perhaps one’s partner wasn’t completely invested. Wasn’t really there? She adds: “Thurston would do his thing, including assorted side project, and I had side projects of my own. No marriage can maintain the thrilling-ness of the early days, and over time, in spite of what my friend said, and as creative as our relationship was, our marriage got progressively lonely, too.” Some of Gordon’s side-projects included a fashion line and some acting roles including one in Gus Van Sant’s fantastic film about Kurt Cobain, Last Days. Gordon writes rather quite a free-form drifting from subject to subject and playing around with chronology. A reader can easily skip around and not be confused. The sections with vivid descriptions of New York in the 1980s and 1980s stand-out for authenticity and color. There’s plenty of awesomeness in this memoir. Insecurity combined with risk taking. Deconstructing one’s experiences.Throughout this memoir, the feminist, artist and musician provides readers coolness, the detachment and strong opinions. Gordon removes herself from personal situations and provides a detached observer’s perspective. At other times she’s a bit warmer. While rambling and occasionally disjointed, it works. On high school: “High school was a dark period for me—I never felt that I fit in, and the other kids seemed alien to me, because, in fact, they were—but I got through.” She did date composer Danny Elfman and they remain friendly. Gordon and her family lived in Hawaii one year and Hong Kong another while her father taught sociology. She’s a fan of Madonna, 1960s groups The Shangri-Las and 1970s brother-sister duo The Carpenters. “Karen Carpenter had interested me for a long time. The Carpenters were such a sun-drenched American dream, such a feel-good family success story like the Beach Boys, but with the same roiling darkness going on underneath.” On Goo is the song “Tunic (Song for Karen)” and later Sonic Youth awesomely and hauntingly covered “Superstar” for the The Carpenters tribute album If I Were a Carpenter in 1994. Daisy Cafritz and Kim Gordon launched a clothing line called X-Girl girl in 1993. They sold it to a Japanese company years later for a nice profit. FTC Disclosure: I received this book for review from Dey Street Books. This entry was posted on February 24, 2015, 19:49 and is filed under Books. You can follow any responses to this entry through RSS 2.0. Both comments and pings are currently closed.